[S11] Index to Wills, 1860 to 1989, 1982. [S4] GRO Indexes to Deaths "1982/Q4 Stratton 21 0483." [S546] E-mail from Lise Estcourt to Teresa Pask dated 19 August 2004 (Cole1.pdf). [S546] E-mail from Lise Estcourt to Teresa Pask dated 19 August 2004 (Cole2.pdf). [S549] Copy birth certificate of Sydney Frances Cole (18 July 1880). Kindly provided by Mavis and Lise Estcourt. [S442] E-mail from Don Cutten to Teresa Pask, dated 12 January 2004: Death 1974/Q1 Fylde 10c 740. [S442] E-mail from Don Cutten to Teresa Pask, dated 12 January 2004: Birth 1880/Q3 I.O.W. 2b 623. [S556] Image of the 1881 census for Ryde, Hampshire: RG11 Piece 1178 Folio 48 Page 47. [S555] Image of the 1891 census for Margate, Kent: RG12 Piece 727 Folio 16 Page 25. [S548] Dorset County Chronicle and Somersetshire Gazette dated 29 August 1935. [S442] E-mail from Don Cutten to Teresa Pask, dated 2 July 2004. [S3] GRO Indexes to Marriages "1953/Q3 CHANT, Maurice G. DUNSTER Yeovil 7c 984." [S602] Black and white photograph of Glyn & Jean Chant's Wedding Party 1953. Kindly provided by Rodney & Sue Adams. [S157] E-mail from Roger Euridge to Teresa Pask dated 2 May 2002. Research Note: There seems to be some confusion on when Julia was born. The year of 1847 is based on her gravestone, and her age stated at marriage. [S162] E-mail from Marcia Martinez to Teresa Pask dated 8 May, 2002. [S449] E-mail from Philip Dorland to Teresa Pask dated 1 August, 2003. [S959] Website Rootsweb (http://www.rootsweb.com) WorldConnect: Ancestors of P. Dorland. [S449] E-mail from Philip Dorland to Teresa Pask dated 1 August, 2003: Family Names from Margaret (Koopman) Joy's file. [S162] E-mail from Marcia Martinez to Teresa Pask dated 8 May, 2002 - Gave date of birth as 27 September 1842. [S950] Website Family Search (LDS) (http://www.familysearch.org) "Michigan, Marriages, 1822-1995," index, FamilySearch (https://familysearch.org/ark:/61903/1:1:FC4T-FQZ : accessed 12 June 2015), George Uridge and Julia Caroline Tremaine, 27 Aug 1866; citing reference p118; FHL microfilm 1,377,622. Event Place: Detroit, Wayne, Michigan. [S1025] Website Ancestry (http://www.ancestry.com) Year: 1851; Census Place: Yarmouth, Elgin County, Canada West (Ontario); Schedule: A; Roll: C_11719; Page: 39; Line: 47. [S489] E-mail from Owen Uridge to Teresa Pask dated 11 March 2013. [S449] E-mail from Philip Dorland to Teresa Pask dated 1 December 2015. [S449] E-mail from Philip Dorland to Teresa Pask dated 24 September 2003. [S952] Website Find A Grave (http://www.findagrave.com) Find A Grave Memorial# 141144852. [S950] Website Family Search (LDS) (http://www.familysearch.org) "Michigan, Death Certificates, 1921-1952," index, FamilySearch (https://familysearch.org/ark:/61903/1:1:KF7L-76K : accessed 12 June 2015), George Robert Uridge, 29 Mar 1930; citing Ann Arbor, Washtenaw, Michigan, United States, Division for Vital Records and Health Statistics, Lansing; FHL microfilm 1,973,126. [S2] GRO Indexes to Births "1888/Q4 WELLSTEAD, Rachel Shepton Mallet 5c 482." [S163] Copy birth certificate of William Edward John Veasey (23 June 1910). [S379] Copy marriage certificate of Gilbert Veasey and Rachel Harris Willstead (3 September 1908). [S1056] Website Find My Past - 1939 Register (http://search.findmypast.co.uk/) RG101 7084D 003. [S4] GRO Indexes to Deaths "1970/Q1 VEASEY, Rachel 14 Oct 1888 Bath 7c 832." 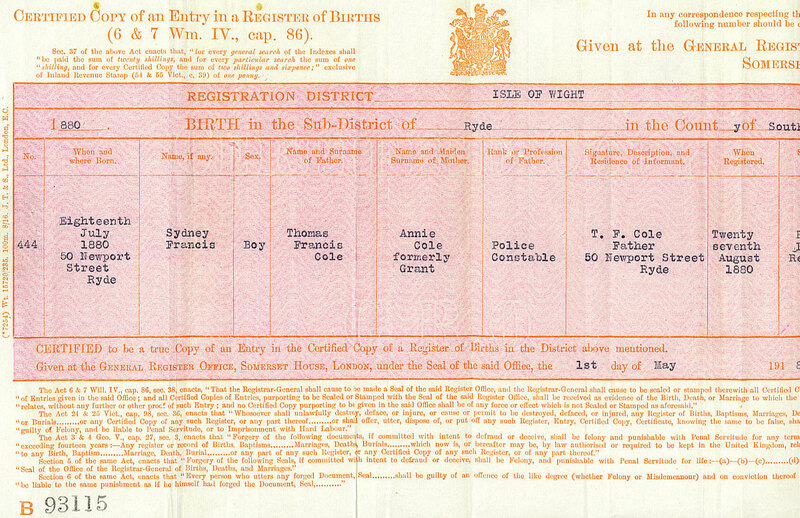 [S164] Copy birth certificate of Arthur Ernest Veasey (10 August 1908). [S2] GRO Indexes to Births "1908/Q3 VEASEY, Arthur Ernest Shepton Mallet 5c 381." [S3] GRO Indexes to Marriages "1908/Q3 Shepton M. 5c 881. There was no cross-reference with Willstead, Wilstead, Willsted or Hillstead." [S2] GRO Indexes to Births "1910/Q3 VEASEY, William E. J. Shepton Mallet 5c 367." [S4] GRO Indexes to Deaths "1998/Feb VEASEY, William Edward J. 23 Jun 1910 Mendip F20D 025." [S4] GRO Indexes to Deaths "1974/Q2 VEASEY, Gilbert 7 Oct 1888 Mendip 23 1149." [S2] GRO Indexes to Births "1913/Q1 VEASEY, Gilbert G. WILLSTEAD Shepton Mallet 5c 690." [S2] GRO Indexes to Births "1915/Q1 VEASEY, Annie E. WELLSTEAD Shepton Mallet 5c 696." [S760] E-mail from Dawn Aldworth to Teresa Pask dated 2 September 2006. [S2] GRO Indexes to Births "1922/Q1 VEASEY, Sidney H. WELLSTEAD Shepton Mallet 5c 641." [S2] GRO Indexes to Births "1924/Q1 VEASEY, Leonard WELLSTEAD Shepton Mallet 5c 595." [S2] GRO Indexes to Births "1926/Q3 VEASEY, Sidney R. WELLSTEAD Shepton Mallet 5c 570." [S2] GRO Indexes to Births "1928/Q4 VEASEY, Michael D. WELLSTEAD Shepton Mallet 5c 526." [S2] GRO Indexes to Births "1931/Q4 VEASEY, Stanley H. WILLSTEAD Shepton Mallet 5c 498." [S164] Copy birth certificate of Arthur Ernest Veasey (10 August 1908) "4 May 2002." [S4] GRO Indexes to Deaths "1982/Q4 VEASEY, Arthur Ernest Aug 1908 Mendip 23 1134." [S205] Copy birth certificate of David John Rees (29 May 1882). [S2] GRO Indexes to Births "1882/Q2 Carmarthen 11a 898." [S206] Copy birth certificate of William Henry Rees (7 February 1884). [S2] GRO Indexes to Births "1884/Q1 Carmarthen 11a 871." [S901] Image of the 1911 census for 26 Mill Street, Carmarthen, Carmarthenshire: RG14 Piece 33040 Schedule 87. [S953] Website Commonwealth War Graves Commission (http://www.cwgc.org) searched 14 July 2002 - all W Rees on the CWCS website. [S953] Website Commonwealth War Graves Commission (http://www.cwgc.org) searched 10 November 2002 - all H Rees on the CWCS website. [S3] GRO Indexes to Marriages "1921/Q2 REES, Sarah = SMITH, Richard Carmarthen 11a 1846." [S4] GRO Indexes to Deaths "1929/Q1 REES, Cornelius Carmarthen 11a 1678 aged 69." [S903] Copy death certificate of Cornelius Rees (6 January 1929). [S1031] Birth information from website Ancestry Civil Registration: 1887/Q3 HOWELLS, Richard Lewis Carmarthen 11a 915. [S692] Image of the 1901 census for 29 Brewery Street, Ystradyfodwg, Glamorganshire: RG13 Piece 5019 Folio 48 Page 31. [S606] Image of the 1871 census for Chequers Alley, Carmarthen, Carmarthenshire: RG10 Piece 5498 Folio 42 Page 32-33. [S458] E-mail from Yvonne Rees to Teresa Pask dated 28 August 2003. [S1077] 1901 Census RG13 Piece 5009 Folio 111 Page 1. [S473] E-mail from Vincent Rees to Teresa Pask dated 9 December 2003. [S458] E-mail from Yvonne Rees to Teresa Pask dated 24 August 2003. [S473] E-mail from Vincent Rees to Teresa Pask dated 1 November 2005: Memorial Card. [S688] Image of the 1851 census for Pensarn, Llangunnor, Carmarthenshire: HO107 Piece 2472 Folio 148 Page 29. [S689] Image of the 1861 census for Dame Street, Carmarthen, Carmarthenshire: RG9 Piece 4140 Folio 53 Page 27. 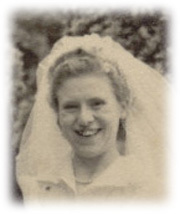 [S1032] Marriage information from website Ancestry Civil Registration: 1873/Q3 RICHARDS, James Carmarthen 11a 1167 = Harriet MOSS. 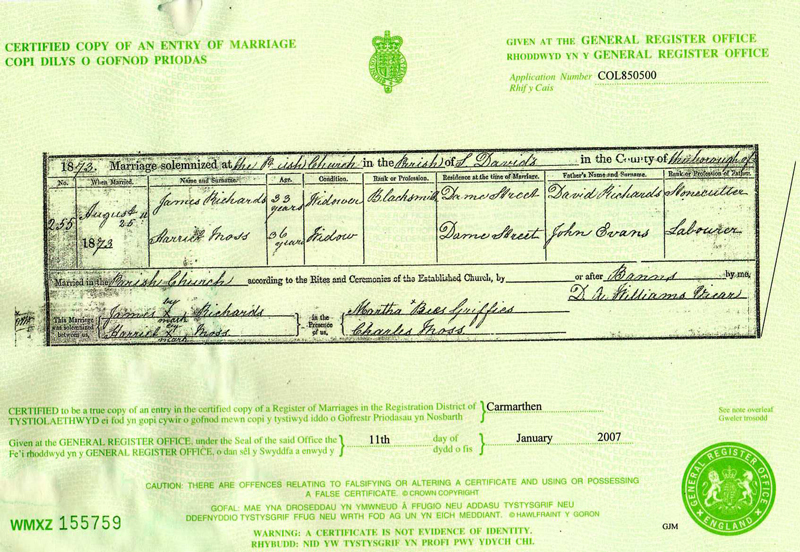 [S786] Copy marriage certificate of James Richards and Harriet Moss (25 August 1873). Kindly provided by Carol Jones. [S3] GRO Indexes to Marriages "1873/Q3 MOSS, Harriet Carmarthen 11a 1167." [S3] GRO Indexes to Marriages "1873/Q3 RICHARDS, James Carmarthen 11a 1167." [S696] Image of the 1881 census for 10 Mill Street, St. Peters, Carmarthen, Carmarthenshire: RG11 Piece 5398 Folio 14 Page 22. [S694] Image of the 1891 census for 5 Moss Lane, St. Peters, Carmarthen, Carmarthenshire: RG12 Piece 4517 Folio 108 Page 15. [S1033] Death information from website Ancestry Civil Registration: 1892/Q1 RICHARDS, James Carmarthen 11a 756 age 51. [S695] E-mail from Carol Jones to Teresa Pask dated 30 October 2005. [S473] E-mail from Vincent Rees to Teresa Pask dated 1 November 2005: E-Mail from Carol Jones. [S705] Image of the 1871 census for Knights Buildings, Carmarthen, Carmarthenshire: RG10 Piece 5498 Folio 84-5 Page 8-9. [S815] E-mail from Diana Davies to Teresa Pask dated 17 July 2008. [S816] Image of the 1851 census for 18 Lammas Street, St. Peter, Carmarthen, Carmarthenshire: H0107 Piece 2473 Folio 126 Page 4. [S817] Image of the 1861 census for Lammas Street, St. Peter, Carmarthen, Carmarthenshire: RG9 Piece 4140 Folio 46 Page 14.